The Swedish Mora clock has increased in popularity in recent years, as many people are attracted to this shapely and uniquely designed clock. If you want to make a visual impact with your clock selection, there is probably no better antique clock out there that can achieve this feat with such ease. The history of the Swedish Mora clock is also a fascinating look into how difficult times can inspire a creative outburst that has stood the test of time. If you are looking for antiques in Denver, learning about this extraordinary timepiece is worth your time. The Swedish town of Mora experienced difficult economic times during the mid-1700’s, as its agricultural and mining industries experienced trying times. As a result, the people of the town of Mora turned to clock making as a way to make ends meet. Throughout the town, families began to specialize in the production of making various parts for the clocks. Traditionally a farming community, Mora townsfolk were drawn to this new industry as a way to supplement their income. Many residents of the region were poor at the time, thus why there were so many who decided to take up this unique trade and craft. Whether it was the face of the clock, the mechanical interior parts, the wood long case or the exterior painting of the clock, Mora residents found their niche within this particular industry. At the height of its popularity, approximately 100 families in the town were involved in the production of making this treasured staple of time-keeping. Throughout the province of Darlana, each individual area produced a different part of the clock. This process resulted in some very unique and creative clock designs that were a collaboration between residents of this particular part of Sweden. The clocks would first be sold without a case and then the person buying the product would ask locals in the area to make the wood case. The sizes and shapes of the Swedish Mora clock also varied according to the region in which they were produced. Clocks that were manufactured in Northern Sweden were typically tall and slender, while clocks that were produced in Southern Sweden were usually fat and were accentuated by exaggerated curves. Estimates by Gunnar Pipping state that more than 50,000 Mora clocks were produced throughout the 19th century. During the height of its production, there were around 1,000 Mora clocks being made each year. Over time, competition from Germany and America would lead to the demise of this once burgeoning industry for Mora. What was once a lucrative market for Mora in the 18th and 19th century became impractical and no longer profitable. Now, the clocks made during that era are prized as cherished antiques, still adding charm and function to today's modern home. Mora clocks can come in a variety of shapes in sizes, and speak to the personality of the person that created it. 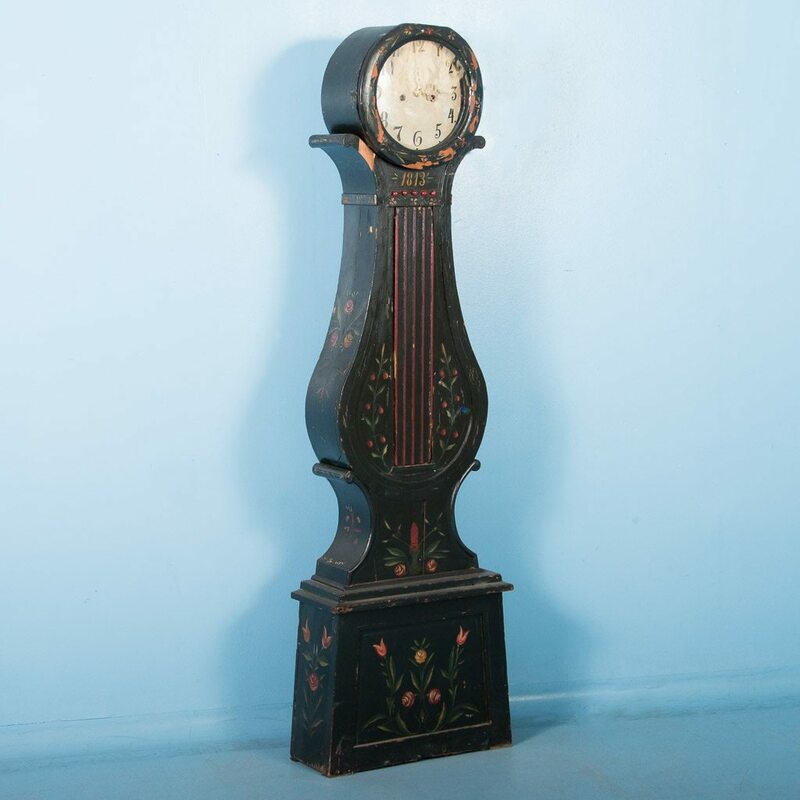 These clocks are generally known for their tall and slender appearance, and are able to fit into tight spaces much easier than English clocks of a similar style. This is due to the fact that Mora clocks are shallower than the English variety. In terms of their size, Mora clocks are approximately 8 to 12 inches deep, 20 to 28 inches wide, and 70 to 99 inches tall. The face of the clock tends to measure about 19 inches in diameter. The numbers and minute markers on a Mora clock are one of the clock’s decorative elements, and were usually painted on in black paint. The design of a Swedish Mora clock is classic and, ironically, timeless. Each Mora clock has its own individual personality, and has been handcrafted to create a truly unique piece for your home. The history creates a depthness of character that is unparalleled by any other piece. Adding a Mora clock to your home can add a layer of history to your living space that makes the process of entertaining guests fun and informative. Your Mora clock won’t just be a decorative piece, it will also be a story waiting to be told to those lucky enough to hear it. Mora clocks come in a variety of specific styles, which is helpful when deciding which Mora clock would work best in your living room. Each style category has unique distinguishing characteristics, giving you a diverse selection from which to choose. The Fryksdall are clocks that have a wider belly with a pinched waist, and also have exceptional hood carvings on the unit. Typically, these clocks come in white and greys, and were usually owned by wealthier individuals. Country clocks were typically more plain in appearance and had less decoration. They came with simple hood crowns and using much less glass than their counterparts. These were usually the prized possession in poorer families, and were often given as wedding gifts. City clocks were those that had a much finer level of decoration. These usually included painted finishes that made a strong statement stylistically, and would also set them apart from other varieties. Bridal clocks were those that were more odd and unusual than the rest. These tended to originate from Jamtland, and had a very fine level of decorative carving on them. In fact, they are likely the finest clocks in terms of the level of craftsmanship. Scandinavian Antiques is happy to assist you in finding the most appropriate Swedish Mora Clock for your modern household. We will make sure that aside from adding beauty, the clock will work to your specifications whether you choose to have the orginal works and chimes restored or opt for the ease of a battery function eliminating the need to wind and set the clock weekly. Our team of qualified associates are dedicated to delivering the best customer service in the industry, and are delighted to help you bring this antique timekeeping centerpiece into your home. We typically have aproximately 10-20 Mora clocks available at any given time, and import directly from Sweden throughout the year. Our owner, Henrik Follin, was born in Sweden and has worked with original Mora clocks over 30 years as an antique wholesaler. With over 24,000 sq ft in Denver of European antique furniture inventory, you wil not find a greater selection anywhere. Our team's attention to quality and detail is accentuated by our 2,000 square foot studio, where our craftsmen work to restore the integrity of our antiques. If you are interested embarking on a journey to blend the past with the present, contact us today! Workbenches have been a staple in a woodworkers stable of tools for centuries. These tables are used for a variety of different uses, each table reflecting the specific type of work that the owner is involved in. Designs have changed over the course of time and have been adjusted and updated with the advent of modern power tools and various new techniques. Despite the very specific designs and uses when they were first built, their longlasting durability and aesthetic provide a varietry of opportunities for interior decorating with a bit of creative touch. If you are interested in learning more about European antiques and workbenches and how to encorporate them in home furnishing, continue reading for further explanation. Workbenches have been around for centuries, and have evolved over time to meet the demands and needs of the worker that uses them. Earliest examples of the workbench stretch back to Egypt with examples of rocks with notches that were used for bracing work. Though these do no resemble modern day workbenches, these Egyptian contraptions would be considered proto-benches, as they served a similar function and purpose as their modern-day equivalent. The Roman empire would eventually leave its mark on the world of workbenches, as its influence was clearly felt in nearly every facet of modern society. The Roman workbench has been around in some form for approximately 1,400 years. From drawings, we can surmise that the Roman workbench consisted of a solid plank top with legs tenoned into it. Unlike their modern equivalent, these benches had no addition shelving below the top plank and also did not have any drawers or other components that make later versions of the workbench that much more convenient for the person that uses it. The European workbench has been around for about 200 years, and the form has evolved over time. The European workbench has been the dominant style in the western world over the last century and has continued to be a popular choice for woodworkers to this day. One of the primary distinguishing features of the European workbench was the addition of vises, which are mechanical apparatuses that are used to secure an object to the workbench in order to allow a work to be performed on it. There are two main categories of vises to be aware of in regards to workbenches. The first are those that are on the end of the bench. These end vises, also referred to as tail vises, are typically mounted to the right portion of the bench and are designed for right-handed workers. The second type of vise used in workbenches are front vises, which are usually mounted on the left front side of the workbench. These can be utilized for holding boards to be edge jointed, and can also be used for sawing dovetails and things of that nature. French benches of the 17th and 18th century depended on stops and dogs to hold a piece in place, which contrasts sharply from its British and American counterparts, as they relied more on vices to hold a piece in place. The location of a vise on a workbench is one of the primary distinguishing features of what separates one style of bench from another. The standard cabinetmaker’s bench is one that is fitted with a tail vise as well as a face vice. The Scandinavian bench is one that is marked by is dog-leg vise, one that does not impose a limit on the size of workpieces that can be held in it. At Scandinavian Antiques, we believe in giving beautiful historic pieces new purpose. Perserving and extending the life of these objects is our passion. Sometimes this means finding new utility for our wares. Workbenches, like many antiques, can provide a number of uses that may not seem immediately obvious. With the help of our workshop and expertise, we will help you match the form you love to the function you need. The possibilities are endless. A workbench could be cut down for a coffee table, complete with a recessed area for remotes or quick use items. Rather than cutting it down, a workbench could also be built up and used as stunning kitchen island. By simply adding a shelf between the lower trestle stretchers, one could make a unique bar or sofa console table. With our craftsmanship and a bit of imagination, you will find the ideal place for a workbench and the perfect use for continuing it's long life. Scandinavian Antiques specializes in the finest European antiques and we take care to stock pieces that will serve our clients functionally as well as aesthetically. We have a passion to find unique items and hand select every piece we sell to ensure you are receiving the best quality antiques available in the United States. When it comes to antique workbenches, this is no different. Currently, we have a approximately 20 antique carpenter’s workbenches for sale that are an example of our vast inventory. While a few can be found on our website (under "Workbenches" and "Latest European Container"), many more can be found in our two local Denver warehouses, the first conveniently located next door to our showroom. These workbenches are awaiting restoration, so are a perfect choice for a personalized project ready for your customization. Each has it's own charm and character, so be sure to peruse our warehouse to find the one that speaks to you. When you make your selection, we will restore it to your specifications so that your needs are perfectly met and the workcbench is ready for whatever use you have in mind. One of the workbenches we have for sale is an incredible Danish workbench with a solid top that is sure to impress anyone who comes into contact with it. This beautiful workbench is from the late 19th century, and bears an exquisite patina from years of traditional use. Unique to this table is that we added a piece of wood to the recessed tray, now providing one continuous top, perfect for a desk or to display a large sculpture as a console table. This piece has a single wood handled vice and includes a traditional trestle base which allows for easy assembly and take down. This particular bench has been restored and waxed, allowing you to rest easy in knowing it is durable and ready for many more years of use. Another carpenter's workbench that is currently for sale is a rustic workbench ready to be customized or refinished for use in a home or office. This piece is from our “un-restored” collection; it just arrived from Europe and is still in "warehouse condition." Prior to leaving our store, like all our antique furniture it will be professionally restored in our workshop to ensure it is stable, strong, ready for use and completed with an appropriate finish. This particular piece will be re-listed upon its restoration, allowing you to see how much attention to detail Scandinavian Antiques takes when it comes to restoring our antiques. If you are in the market for a strong and sturdy antique workbench loaded with character, we are confident we have a piece that will meet your personalized needs. While these particular pieces are incredible for their ability to show off your individual interior decorating taste, they are terrific functional options as well. Whether you desire to have a piece of history as a collector’s item, repurpose an antique in a modern way, or actually intend to use the workbench for it’s original function, we are certain you will be pleased with the incredible selection we offer. Scandinavian Antiques is happy to assist you in finding the most appropriate European antiques for your modern household. We have over 30 years of experience as an antique importer, and our attention to quality and detail is accentuated by our 2,000 square foot studio, where our craftsmen work to restore the function of our antique furniture. With over 24,000 sq ft of inventory, if you are interested embarking on a journey to blend the past with the present, contact us today!